Ubisoft’s got a lot on its plate right now. It’s revived Rayman series is about to get a new Wii U entry with Rayman Legends; ZombiU is a strong new franchise; Watch Dogs doesn’t exist in any real way and people are psyched up for it; it bought up Obsidian’s South Park: The Stick of Truth and Patrice Desilet’s 1666 from THQ; and Splinter Cell Blacklist is about to bring Sam Fisher back to living rooms after a three-year hiatus. And that’s not even counting the non-gaming things it is up to, including Assassins Creed and Splinter Cell films. The schedule is just packed. Hence, it makes sense why Ubisoft is stepping away from one of its most profitable and last series, Prince of Persia. Ubisoft Montreal CEO Yannis Mallat confirmed in a new interview with IGN that despite the fact that the company hasn’t put out a new Prince of Persia since 2010, the series isn’t coming back any time soon. Jordan Mechner’s original Prince of Persia was a staple of PC gaming after it was first released in 1989, but the series didn’t become a huge part of Ubisoft’s stable of properties until the series was re-imagined in Prince of Persia: The Sands of Time on PlayStation 2, Gamecube, and Xbox in the early ‘00s. A series of sequels to that game sold well, but to diminishing returns. 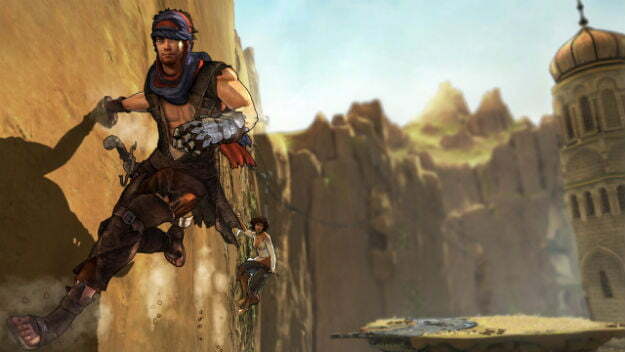 Ubisoft has tried to resuscitate the series twice in the past five years, first with a fantastical reboot in 2008 (pictured above) called Prince of Persia and then a return to the Sands of Time series in 2010 with Prince of Persia: The Forgotten Sands. Neither recaptured audiences’ attention. The critically panned 2010 Prince of Persia: Sands of Time film starring Jake Gyllenhaal didn’t help, despite managing a decent international gross. It appeared in August that Ubisoft was planning to reboot the series yet again with a game codenamed Prince of Persia Zero, targeted at next generation consoles like the Xbox 720 and PlayStation 4. Based on Mallat’s comments that game may have been shelved, though that doesn’t mean the series is dead.